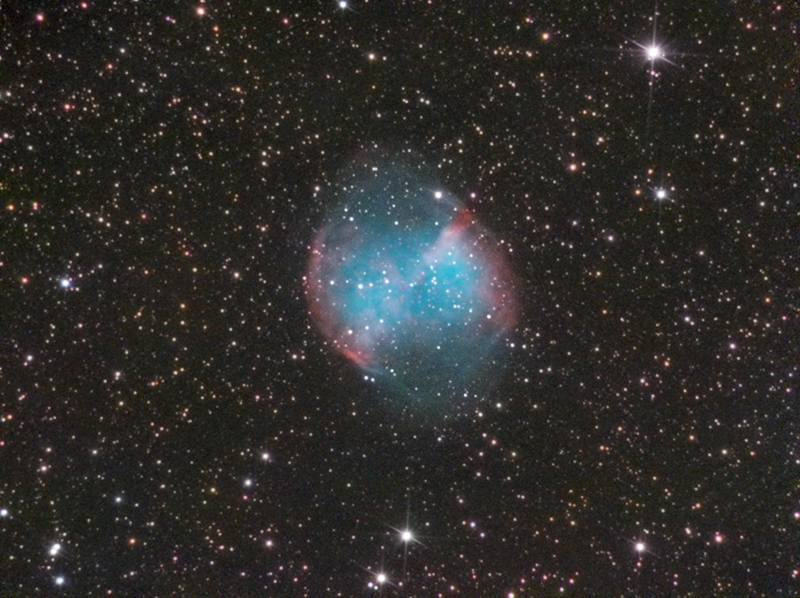 The Dumbbell Nebula is a planetary nebula in the constellation Vulpecula, at a distance of about 1,360 light-years. This object was the first planetary nebula to be discovered; by Charles Messier in 1764. This is my second try to shoot this great and beautiful nebula using the camera ASI224 MC. My first try wan’t good enough (seeing was bad, focus not good, …), so i decided this time to do it again. Last the seeing was perfect, no wind, no clouds. I took using the free software Firecapture 550 of light frames at 5.6 seconds of exposure and some Darks and Offset / Bias frames. After that in Deep Sky Stacker i stacked them together and kept only 80% of the best frames. The final image processing was done in Pixinsight and Adobe Photoshop. Taken on 17 August 2017. Next story Where to watch the 2017 solar Eclipse LIVE online ?